At the top, we perform an intersection, so as to keep only the parts of the sphere and the box which overlap. The bottom is a union, a combination of the three cylinders. In the middle, we have a subtraction, taking those cylinders out of the counded box we created at the top. In this tutorial, we will use the shapes and transforms we already know in order to model a Rook entirely in ShapeJS, learning all the boolean functions along the way. Union is the simplest boolean. It takes the two or more data sources added to it and combines them into a single data source. This allows you to display or transform them the same way as an individual data source. In this simple example, we union a box and sphere. Let's try a slightly more interesting union. In the code below you can see four different different shapes, three cylinders for the base and a box for the trunk, that we can use as the start of our Rook. They have all been added to a single Union called "assembled." We did not bother to separately define the tops of bases 2 or 3. This is because we want the whole base connected and so the top of the second part should always be the bottom of the first, even if we later decide to change the size. Because we created a Union with these four data sources, we can simply tell ShapeJS to return that Union in the scene so as to display all of them. We will add subsequent parts of the Rook to this Union. The Subtraction function takes two data sources, and treats the second source as a negative, removing everything it overlaps on the first data source. Let's start with a simple example. It would be very difficult to model the Rook's distinctive turret just using primitives. By using Booleans we can carry out the far simpler task of creating the shape we need to remove from the basic cylinder of the turret. What we want is a cylinder to start with, to remove the center of the turret. At that point, however, what we have is an impractical cup. We also need three boxes removed to create the battlements. Once we have all these data sources, we run into a problem: Subtraction only takes two sources, but we have five. We could boolean out each one individually, but that would be a pain. What we can do instead is perform a Union on the four shapes to be removed, and then use that as the second source for a single Subtraction. The Intersection Boolean will result in a data source that is comprised only of the area in which all its shapes overlap. Here is a simple intersection between a box and sphere. You may have noticed a gap between the turret and the trunk. We could just extend the trunk up or the turret down, but a smoother transition, like what we have in the base, would be more appealing. An intersection can be used to create non-standard shapes, such as below, where five planes are used to create an inverted pyramid shape. When performing Boolean operations, you may end up with sharp edges that you do not want. In this case, you can use the setBlend() function to add smoothing in the overlapping area. Let's try out blending as a way to get rid of the hard line at the base, where the cylinders attach to the toruses, then we might like. We do not want to blend the whole Rook so we will need to move the specific data sources we want smoother into a new Union, then add that new Union to the "assembled" Union. 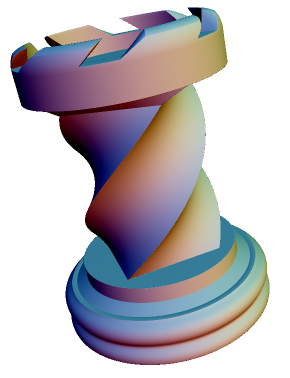 We'll do something similar in order to smooth the portion of the battlements we just used the cone Complement to Boolean. Now we have our Rook all smoothed out. Since the entire Rook has been put into a Boolean Union, we can apply transformations to that Union in order to apply them to the entire data source. Go ahead and give that a shot. 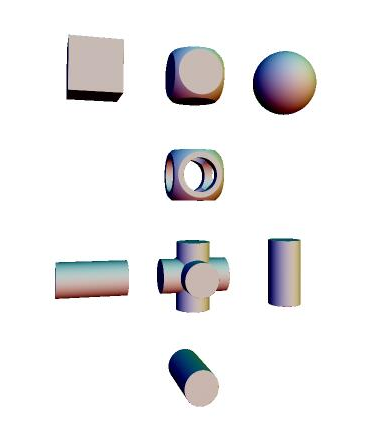 To get something like what is below, you will need a composite transform.